Lemon Kush Headband marijuana seeds, a Sativa dominant strain that was designed to reach for the stars in term of the taste and smell. 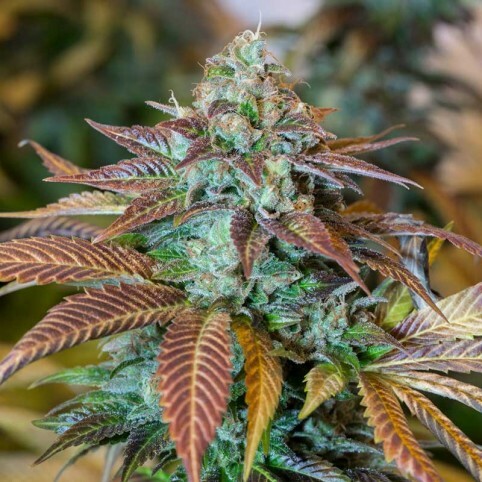 The parentage is noble and lends a remarkable array of strengths; It yields brilliantly, is pretty easy to grow and it has a really strong resistance to mold and disease.Back in 2011 the HSO team received a cutting of the elite Super-bud and so it was decided that they would enter it into a breeding program, it was then crossed with a thoroughly selected Headband male and then later on with the Original OG Genetics. The strain produced at the end is a spellbinding manifestation of size, aroma, color, and taste. The taste is magnificent, bringing you a mixture of sharp diesel overtones with a sour flavor entwined in a series of sweet and citrussy undertones. If you are looking for an effect which will keep you going then this is the one. This long-lasting experience will connect the smoker to a deep yet uplifting and cerebral understanding. When growing outdoors it performs best in temperate, Mediterranean climates. When growing the Lemon Kush Headband inside or in a greenhouse it is best to keep the growing periods short, this is because it does have a tendency to stretch while in the flowering period. This is a real gem of a strain and it's why these marijuana seeds are recommended even for the growers who are the most demanding. The term ‘OG’ was originated in the hip-hop industry to mean ‘Original Gangster.’ But when it comes ..